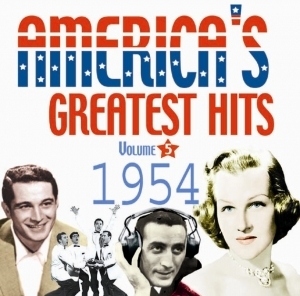 Our American chart hits series now reaches 1954 and includes 25 classic tracks all of which reached the top on the American Hot 100. Rock and Roll was still a couple of years away and American pop music remained as king of the hill. This album presents the very best from a strong year and the track listing speaks for itself. The album starts with the stirring sounds of Eddie Fisher?s Oh Mein Papa, and covers all aspects of early 50?s pop with The Happy Wanderer, Stranger in Paradise and This Ole House. A lovely collection of tracks, from pop to light country, with the orchestral and the quirky, all finding a place side by side. The album also shows the increasing popularity and influence of TV in American culture and artists crossing from one medium to the other. With extensive notes featuring details of every song and performer this will be as popular as all the other volumes.